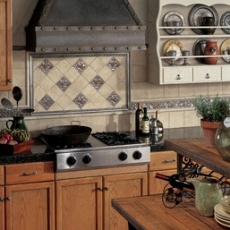 New Daltile Metal Backsplash and Wall Tile - On Sale At Ecomoso - Kitchen Tile, Bathroom Tile, and more! Daltile is known for thinking - and creating - outside the box - and that’s exactly what they have accomplished with innovative new Daltile Metal Tile Collections. For reasons we don’t understand, eco-friendly metal tile is not often the first thing that comes to mind when it comes to the perfect wall and backsplash tile. However, metal tile is currently one of the most viable options for home remodels, while still remaining a commercial tile favorite. What’s not to love about metal mosaics? Especially considering it can be made to mimic more costly materials, like brass and bronze. When it comes to the advantages of metal floor tile or metal wall and backsplash tile, perhaps the most important factor to consider is the versatility and durability. Metal tile is highly capable in both categories - extremely versatile courtesy of infinite, customizable designs, and incredibly durable because it is moisture, allergen and bacteria resistant. 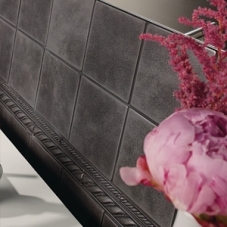 Daltile metal tiles are also essentially maintenance free, making them an easy choice - literally and figuratively. In the last several years, metal tile has also become widely popular, and is increasingly used for residential projects, discarding the limitations that have typically left metal mosaics for commercial use. 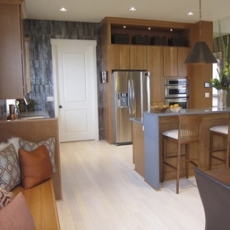 With a vast array of colors, textures and finishes - and the eco-friendly, sustainable flooring factor - there are so many directions you can go in terms of design. 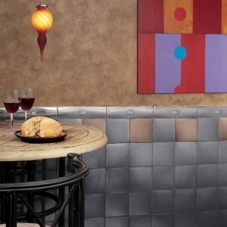 New Daltile Metal Tile Collections on Sale at Ecomoso - Kitchen Tile, Bathroom Tile, etc. 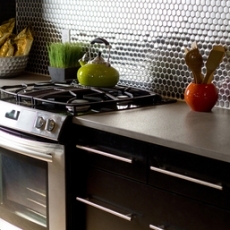 Whether looking for the perfect commercial metal tile for a current or future project, or in search of modern metal mosaics for a kitchen remodel, bathroom remodel or metal backsplash idea - Daltile Metal Tile and Mosaics Collections are sure to provide everything needed for a striking new aesthetic in any interior or exterior space. Metal wall tiles are made of genuine metal material, like brass, copper, steel, bronze or aluminum, or any other type of metal. Because metal is easily recycled, metal mosaics and metal tile are incredibly favorable because they don’t leave a destructive carbon footprint when it comes to the environment. 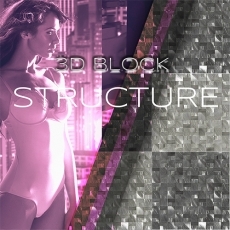 Additionally, the design aspect of metal tile makes it a popular choice. There are so many unique textures and different looks and colors, that customizing any room becomes very simple. You can use metal tile to construct a unified flooring pattern, or combine different looks for a truly one-of-a-kind floor or backsplash. But perhaps the most exciting element to this sustainable flooring is the extreme, natural durability that allows for metal flooring to last well over 20 years when cared for properly. So you get to keep what you love for a very long time. Not only are there a wide range of design capabilities; metal flooring is well suited for a volume of interior and exterior areas, used as things like basement tile, kitchen tile and bathroom tile, or for creating a custom look with a metal kitchen backsplash or metal bathroom backsplash. Metal tiles are most often used in basements, kitchens and bathrooms. What allows metal floor tiles and metal tile in general to be a practical choice is the fact that they are water, allergen and bacteria resistant, and also low maintenance and easy to clean. 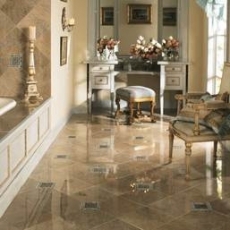 Below you’ll find all the sophistication and style of authentic metallic look tile within the Daltile Metal Collections.